Tens of thousands of passengers have been disrupted by drones flying over one of the UK’s busiest airports. Gatwick’s runway has been shut since Wednesday night, as devices have been repeatedly flying over the airfield. Sussex Police said it was not terror-related but a “deliberate act” of disruption, using “industrial specification” drones. An airline source told the BBC flights were currently cancelled until at least 19:00 GMT. The airport advised that the runway would not open “until it was safe to do so”. Defence Secretary Gavin Williamson has confirmed the Army has been called in to support Sussex Police. Those due to travel have been told to check the status of their flight, while Easyjet told its passengers not to go to Gatwick if their flights have been cancelled. The shutdown started just after 21:00 on Wednesday, when two drones were spotted flying “over the perimeter fence and into where the runway operates from”. The runway briefly reopened at 03:01 on Thursday but was closed again about 45 minutes later amid “a further sighting of drones”. The airport said at about 12:00 a drone had been spotted “in the last hour”. He said police had not wanted to shoot the devices down because of the risk from stray bullets. He said it remained unsafe to reopen the airport after the drone had been spotted too close to the runway. More than 20 police units from two forces are searching for the perpetrator, who could face up to five years in jail. Supt Justin Burtenshaw, head of armed policing for Sussex and Surrey, described attempts to catch whoever was controlling the drones as “painstaking” because it was “a difficult and challenging thing to locate them”. “Each time we believe we get close to the operator, the drone disappears; when we look to reopen the airfield, the drone reappears,” he said. How have passengers been affected? 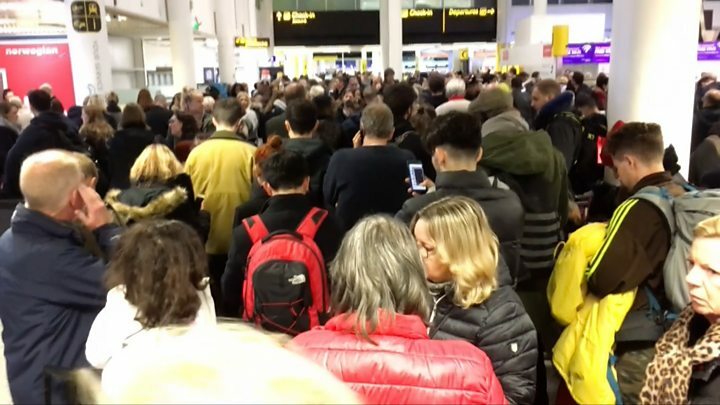 About 10,000 passengers were affected overnight on Wednesday and Gatwick said 110,000 people were due to either take off or land at the airport on Thursday. Incoming planes were diverted to other airports including London Heathrow, Luton, Birmingham, Manchester, Cardiff, Glasgow, Paris and Amsterdam. Crowds of travellers spent the morning waiting inside Gatwick’s terminal for updates, while others reported being stuck on grounded planes for hours. Are you waiting for your flight at Gatwick Airport? Email haveyoursay@bbc.co.uk. A Gatwick spokeswoman said extra staff had been brought in and the airport was “trying their best” to provide food and water to those who needed it. About 11,000 people are stuck at the airport, Mr Woodroofe said. A number of flights bound for Gatwick were diverted to other airports overnight, including seven to Luton, 11 to Stansted and five to Manchester. Other flights have landed at Cardiff, Birmingham and Southend. The Civil Aviation Authority said it considered this event to be an “extraordinary circumstance”, and therefore airlines were not obligated to pay any financial compensation to passengers. Alex Neill, from consumer rights group Which?, said people “may still be entitled to meals, refreshments, hotel accommodation or transfers”. 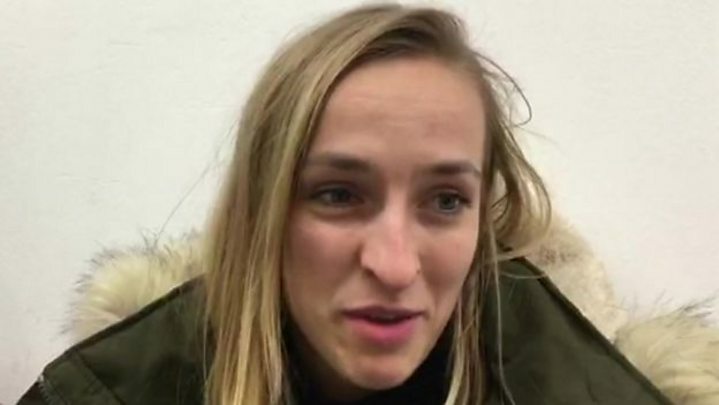 Kasia Jaworska told the BBC she was travelling from Glasgow to Gatwick with her boyfriend when her flight was diverted to Luton. She said she thought it was “strange” that two drones had led to the closure of the airport. “You would imagine there would be better security in place and emergency action for something like that,” she said. Christopher Lister, who had been returning from Kiev, posted a picture of people sleeping “on every seat and across the floors” on board his flight. He said the photo was taken six hours after the plane – which was due to arrive at Gatwick – landed in Birmingham. Media captionPassengers affected by disruption at Gatwick Airport spoke of their frustration. Luke McComiskie, whose flight ended up in Manchester, described chaotic scenes as people tried to find their way home after more than three hours stuck onboard. The 20-year-old, from Aldershot, said: “We got told there would be some arrangements with coaches for us when we get out the terminal. It is illegal to fly a drone within 1km of an airport or airfield boundary and flying above 400ft (120m) – which increases the risk of a collision with a manned aircraft – is also banned. Endangering the safety of an aircraft is a criminal offence which can carry a prison sentence of five years. The number of aircraft incidents involving drones has grown dramatically in the past few years. In 2013 there were zero incidents, compared to almost 100 last year. Civilian drones have grown popular as their price has fallen. Technological improvement has meant components are smaller, faster and cheaper than ever before. The UK Airprox Board assesses incidents involving drones and keeps a log of all reports. In one incident last year, for example, a pilot flying over Manchester saw a red “football-sized” drone passing down the left hand side of the aircraft. In another, a plane leaving Glasgow narrowly missed a drone. The pilot, in that case, said the crew only had three seconds of warning and there was “no time to take avoiding action”.